Hermitage means a place where one can live in seclusion, away from people, communing with nature, and that certainly describes William Wendt’s personal philosophy. A quiet man, his letters and his paintings (which are usually free of any sign of human presence) make it clear he sketched in the open in order to accurately transcribe nature’s qualities. The source landscape from which Hermitage was sketched is currently unknown, but most of Wendt’s paintings were direct transcriptions of some actual place, and at least three other pictures of this site but from different angles are known. One suggestion is a spot between Ojai and Santa Paula where there is an actual hermitage. 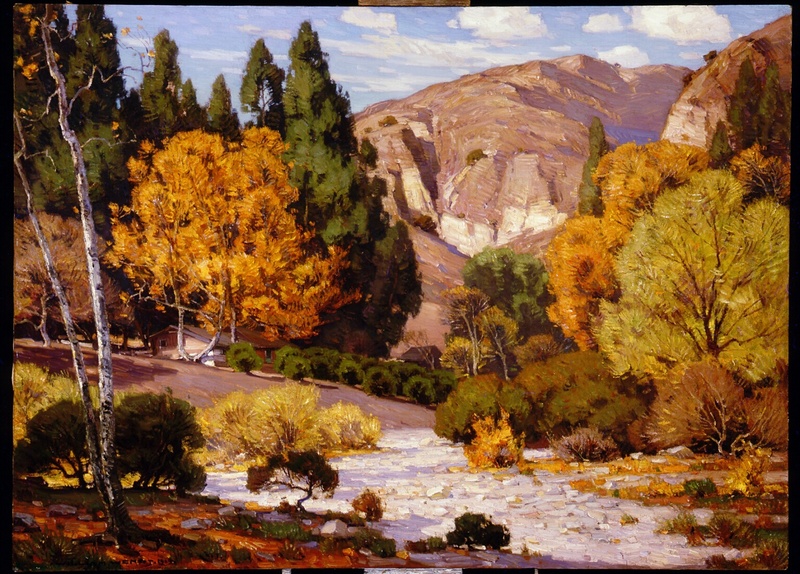 Wendt’s painting technique evolved throughout his career, and each collector has his favorite period. Between c. 1912 and c. 1922, when this painting was rendered, Wendt was using a medium-sized brush and including a variety of colors in his compositions. By the mid 1920s, perhaps unwittingly, Wendt succumbed to post-Impressionist influences and broadened his brushwork and flattened his compositions. 1919 may or may not be the actual date this painting was completed as Wendt often dated a work only when it left the studio as a sale or for exhibit. Paintings this large, sometimes referred to as “exhibition pieces” because they were made to impress painting juries by their size and elaborate compositions, are relatively rare in Wendt’s oeuvre. Wendt’s talent made him one of only a few California artists to be accepted into the prestigious National Academy of Design in New York.